Heads up Dec 22nd live show will be cancelled. We will reviewing our list of the top primary factions and books in the meta at the end of 2016. Special Guest Skari. In this episode of CanHammer, Chris is joined by Jon. They discuss some Age of Sigmar and go over thier tournament expierience at Da Boyz GT 2016. 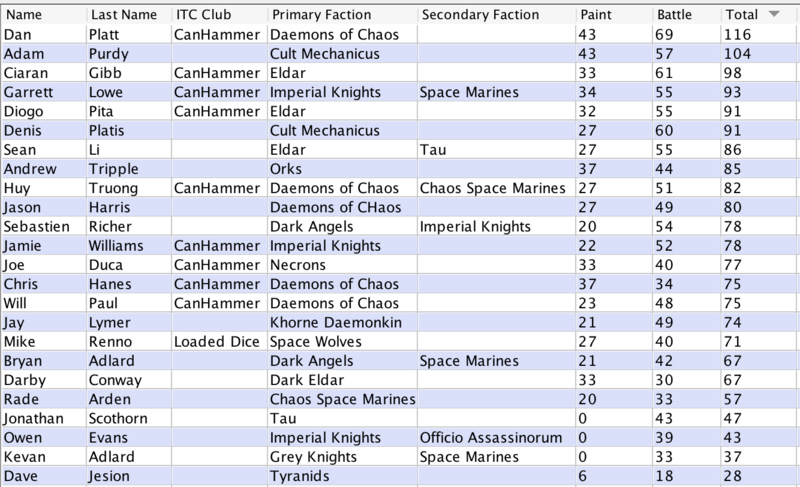 We also pimp some Stormcast Lists. CanHammer Ep 86 -AOS, CCBB AGE OF SIGMAR! Direct Download: CanHammer Ep 86 -AOS, CCBB AGE OF SIGMAR! In this episode of CanHammer, Chris is joined by Jon and Alex, we go through CCBB AOS tournament and the top lists. We also do a Destruction pimp my list for a listener named Nick. Welcome to a Multizone and 1 Plus Armour co-hosted 40k tournament which will be part of the ITC series! We hope to provide a competitive environment with an emphasis on having fun with our toy soldiers. Please read our tournament pack carefully. We hope you enjoy the tournament, and we appreciate any feedback you can provide, positive or negative! $20 through PayPal to logan.maclaren@gmail.com. Entrants must pre-pay in order to retain their spot on the list, otherwise they may be bumped for someone on wait list willing to pay. Direct Download: CanHammer Ep 83 -AOS, We Can Play Competitively Again! Big thanks to everyone for coming out! Stay tuned for information on Powerfists & Psykers 5! Welcome to a Multizone and 1 Plus Armour co-hosted 40k tournament & fundraiser, which will be part of the ITC series as an RTT event! We hope to provide a competitive environment with an emphasis on having fun with our toy soldiers. Please read our tournament pack carefully. Please enjoy the tournament and we appreciate any feedback you can provide, positive or negative! In the interest of full transparency, this event is both a tournament and a fundraiser event as noted above. 85% of the potential entry fees go straight back into player pockets in the form of prizes. 15% of proceeds from entry fees are going into the 1 Plus Armour coffers both to cover our expenses of running the event, so that we can improve the quality of content we create for everyone to enjoy, as well as to bolster the quality of our tournaments and events moving forward. Disclaimer: This can and likely will be further modified prior to the event, please check it again as we get closer to the date. We are once again doing a Fundraiser/Raffle! This time, 100% of proceeds will go to CHEO (cash only). The raffle prize... is Angron! 100% legit Forgeworld. Donate generously so that it does not go to waste! - No draft FAQ items from GW. - No to Death from the Skies (mostly due to release date, haven't really looked into it yet). Sadly tonight Feb 23, 2016 our live stream needs to be delayed. This is not due to any major issues, just some illness and scheduling conflicts. I am however happy to announce that to make up for it we will be doing 2 live streams in a row to make up for this. Tuesday march 1st 8pm EST - we will be doing the P & P 3 show where we will also cover news (big ITC stuff) and should have a few interesting Guests (Yoshi and Nick). Thursday march 3rd - P & P 3 show will hit Itunes! Tuesday march 8th - we will be doing our regular scheduled show topic to follow with another interesting guest. Thursday march 10th - Regular scheduled show will hit Itunes! If you have any questions email us! Also, we raised ~$125 and ~20 donated items for the Ottawa Food Bank!